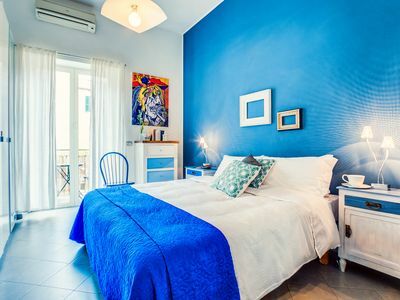 LA TERRAZZA SUI DUE GOLFI is a marvellous apartment on multiple floors with a view of the sea and the Isle of Capri. 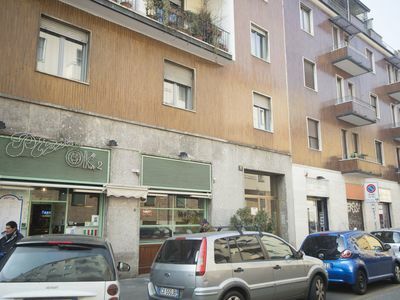 It is part of a Villa complex, with the owners living on one side the building, and it sits near the center of Termini. 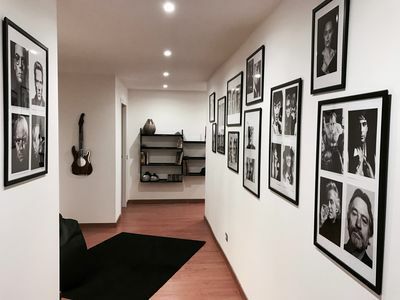 The house is 90 square meters, and can host up to six people. 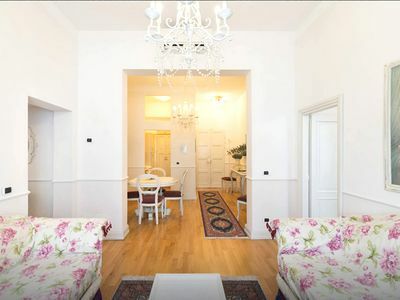 It is equipped with WIFI internet, heating and AC, and affords a splendid view of the Gulf of Naples and Salerno. 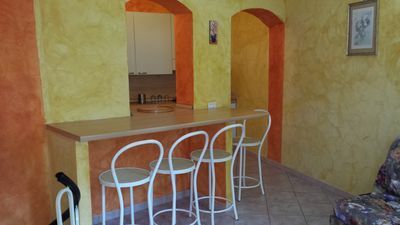 The house is located 200 meters from the center of town where you will find restaurants, a grocery, a bar and a SITA bus station that connects to Sorrento. A couple of extraordinary beaches can be reached from here: Marina del Cantore, at about five kilometers, and the beach at Cala di Mitigliano, about two kilometers away, through steep terrain. 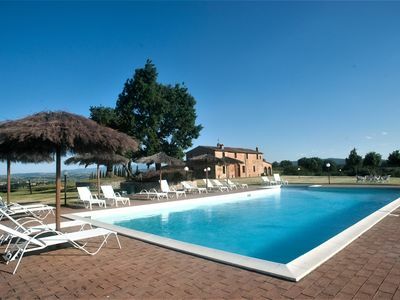 Also only about two kilometers away, near SantAgata Sui Due Golfi, there is an equestrian center, where it is possible to rent horses to explore the area. 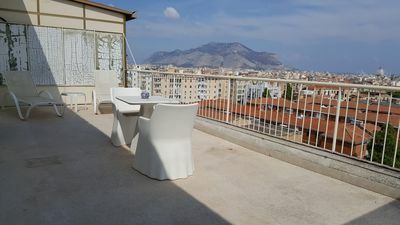 It is not necessary to rent a car to stay at La Terrazza Sui Due Golfi. However, if you are traveling by car, there are paid parking facilities along the street, subject to availability. You reach the house from parking areas on the main street via a stretch of road of about 200 meters without having to climb any stairs. The dcor of La Terrazza Sui Due Golfi is characterized by the use of solid wood furniture, sanded and polished sitting the exterior. In so doing, it melds antique finishes with more modern touches, arriving at a particular, clean lined style. From the warmth of the masterfully polished wood, to the glassware, to the window coverings- everything combines to confer a distinct, harmonious identity throughout the apartment. The use of wood throughout also coordinates with the bedroom floor, a classic parquet inlay in Herringbone style. THE FIRST TERRACE and the private garden are located in front of the house, and lead into the ground floor. This is the main entrance to the house. 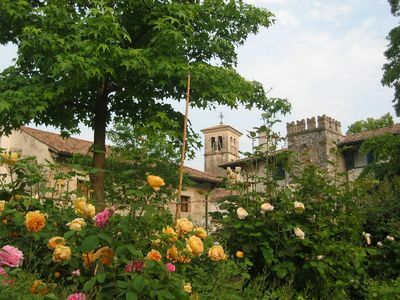 The garden is furnished with a very long table, various smaller tables, wrought iron benches, outdoor chairs and a charcoal barbeque, built into a fixed brick structure. This very large barbeque is available subject to the owners needs. Co-existing with the owner will be not only discrete, but also enjoyable, as they are available for anything you may need or desire to maximize your holiday experience. The outdoor furniture lends itself to hosting large numbers of friends for lunch or dinner. One part of the garden is shaded by many varied plants, and is partially covered by a bamboo pergola adorned by lemon trees. This area is equipped with a rocking chair to catch the marine breeze. The entire terrace and garden is illuminated and can be enjoyed at any hour of the day. The entrance is through an arched door in pentagonal stone which connects into the garden, crossing through another arched doorway made of polished wood and glass. Upon opening the door, light floods in, facilitating your entrance into the apartment. THE LIVING ROOM is accessed directly from the main entrance. 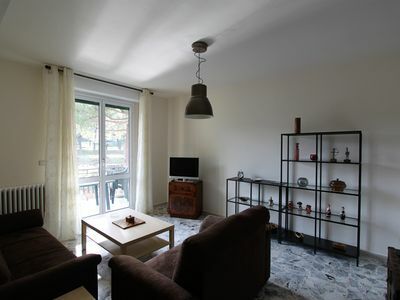 Spacious and well-lit, it is furnished with a sofa, armchairs, a flat screen TV. It shares an open-space with the kitchen offering openness and continuity to the living room. It has a fireplace complete with glass doors which, while warming the room, protect against smoke, ashes and dust entering the space. There is an impressive sideboard with glass doors, which houses the owners keepsakes. The clear porcelain tile floor lends a bright, spacious, fresh feel to the room. - A very well maintained grandfather clock with a brass counterweight and rods, Baroque style, which chimes the hour. This exquisite piece signifies, without doubt, the owners passion for 18th century Baroque style. - The brick and wooden staircase that ascends to the upper floor. It is a very wide staircase, covered in oak wood veneer, comprised of 18 very long treads with low risers, making it easy to climb. The balustrade is completely original: in order to break with the classicism of the space, the customary hourglass form was not used, rather, a more ascetic and modern line of a chessboard, was employed. Rectangular wooden stairs alternate with empty spaces to achieve a space of light and great scale. The staircase dominates two large arches which permit a sightline from the living room to the kitchen, and allow access. THE KITCHEN, a delicate champagne color, is livable and structured angularly, and quite large. It is equipped with a gas cooktop with four burners, and an overhead exhaust fan. 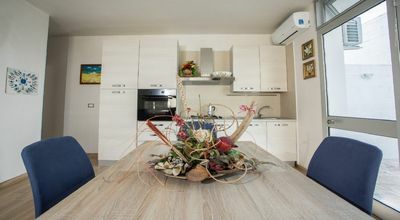 There is an electric oven, microwave, refrigerator with freezer, double sink, dish drainer, abundant cupboards for your provisions and cookware so as to keep everything well-organized. There is an oval table with seating for six, and washing machine. The kitchen is connected stylistically with the living room in that they use the same flooring. The result is an open space plan that allows you to be connected to the living scene while attending to cooking, enjoying a glass of wine while concocting a menu to entertain your family and friends. You access the living room by going under the main arch of the staircase. 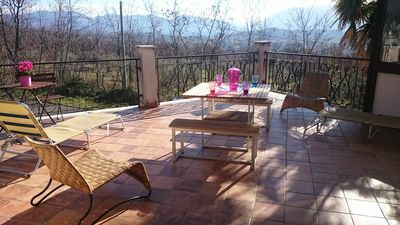 THE SECOND TERRACE is reached from the sliding glass door of the first bedroom and also from the door off the corridor. It is for the clients exclusive use, and will not be shared with the owner. It is furnished with a rectangular charcoal-grey rattan table, which seats six. Due to its exposure to the sun, it is equipped with a large sun umbrella so that can you can have lunch, protected from the intense heat. In contrast from the first terrace which has a cement floor, the second terrace is paved with light porcelain tiles. 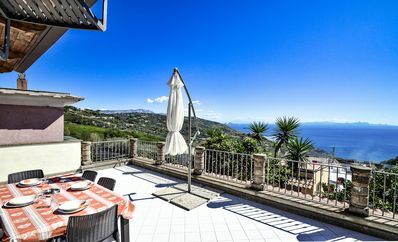 From this terrace you can admire the sweeping sea view, across the Gulf of Naples, or towards Salerno. 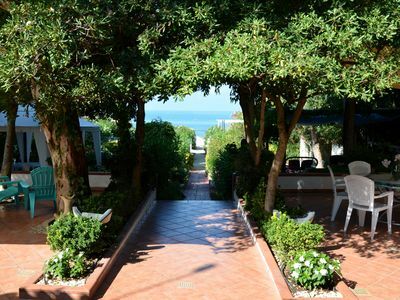 Here is the site of the splendid residence known as La Terrazza Sui Due Golfi. The adjacent smaller villa, lower in elevation, does not block the view: the balustrade is precisely aligned to take maximum advantage of the intervals of space which frame the panorama. Clearly, to enjoy a sunset supper here, enjoying the view will be the icing on the cake of your unforgettable stay! THE THIRD TERRACE is reached via an external spiral staircase with around twenty steps from the second terrace. It is exclusively for the clients use, and will not be shared by the owner. It is furnished with various deckchairs which can be arranged so you may sunbathe in complete privacy. In addition, depending on the position of the sun, a large sun umbrella is provided. The flooring, of clear porcelain tile, is similar to that of the lower terrace. There is also an outdoor shower available to refresh you on those intensely warm summer days. This terrace affords an expansive sea view, with the Isle of Capri so seemingly close that you could reach out and almost touch it with your fingertips. 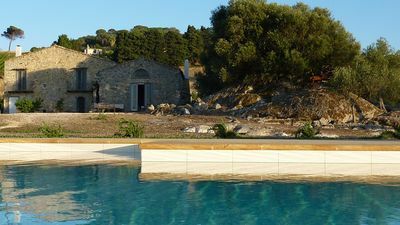 THE FIRST BEDROM has a double bed and a wide window with a view of the second terrace, onto the courtyard, and a partial view of the Isle of Capri. It is accessed from the living room staircase, and then down the corridor. 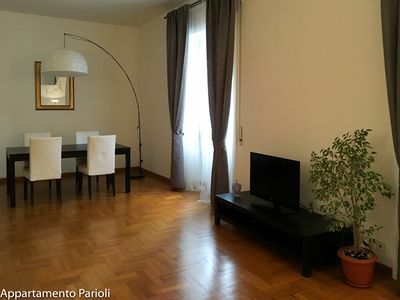 It is very comfortably furnished, with two bedside tables, a dresser and large closet space. It is equipped with AC, flat screen TV, hidden radiators, and has the capacity, at your request to accommodate a crib. The use of light, shellacked wood, adorned with champagne colored squibbles which mirror the same pastel colour on the walls, catapults you into feeling the royal reign of the end of the 1800s. The warmth of the wood and the coolness of the dark wrought iron of the lampshades and chandelier contrast to great effect. 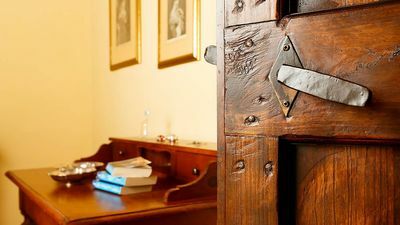 THE SECOND BEDROOM has two single beds and a wide window with a view on to the second terrace, the entrance courtyard and a partial view of the Isle of Capri. It is reached from the living room staircase and then down the corridor. It is furnished with two bedside tables, and an ample closet. The massive wooden headboards, intricately inlaid, transports us to another time and tradition. The room is air-conditioned. THE FIRST BATHROOM is accessed from the corridor. It is the shared bathroom for the first and second bedroom. It has a regular shower, bidet, toilet and washbasin with a mirror overhead and a hairdryer. The floor is in porcelain green to recall the tones of sea and nature, the bathroom itself is also very spacious. scenic trompe l'oeil, will lead you to the bathroom directly from this bedroom. Hidden behind the wardrobe casing on the wall, is the entrance to the bathroom which is obviously not your usual wardrobe. The bathroom has a large tub with shower, bidet, hairdryer, toilet and washbasin and a mirror overhanging. It is very well lit and airy bathroom thanks to an internal window. The floor is a clear porcelain to amplify the effect of brightness and marble finishes. 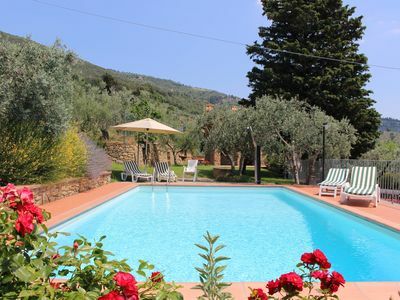 - Tourist tax 2 Euro per day per person for the first 7 nights from April to October 31. The children under 18 years do not pay. - Security deposit: 150,00. The security deposit will be returned prior to your departure unless there are accidental damages to the property. 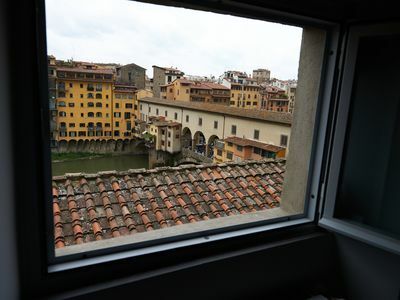 Breathtaking view on Ponte Vecchio!